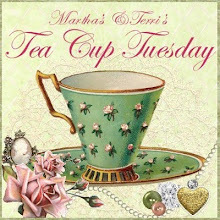 Martha's Favorites: TEA CUP TUESDAY NO. 27! TEA CUP TUESDAY NO. 27! Hi Ladies: Did Tuesday just sneak up on you? It did me, Tea Cup Tuesday No. 27, and I am still thinking it is Sunday night, instead of Monday night. If my dear friend Terri had not sent me Mr. Linky, I would have been late again. 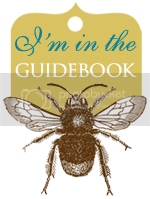 I feel like I have missed so much on everyone blog these last few days. I know I am still running late, but better than last week! I have to get my act together! Please keep praying! I am going to share some very different cups today. The first one is a Black and White and Gold cup made by Clarence China in England. It is No 52 of only 460 made. 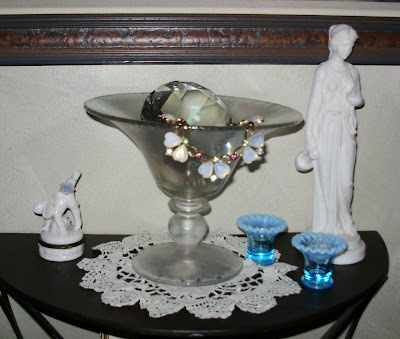 I love the Quatrefoil shape cup that sits on a pedestal. Clarence China, commonly made Chintz designs. This is a rare design for them. I just love how beautiful the Black and White looks. Cup number 2 is another rare cup. It does not have a saucer, I don't know if it ever did. It is another hand numbered, hand decorated piece. This is by Lenox. It has a Fragonard shape with an angular handle all hand done. This is my favorite piece this week. I love the heavy gold they used on this cup. Cup number 3 is this beautiful Limoges, Faberge, demitasse cup. The cup features a Victorian couple, in period attire, in a natural outdoor setting. This beautiful cup is a Royal Blue in color with a ribbed shape cup. It features a beautiful broken loop handle that is very common in Limoges cups. The saucer is scalloped with hand painted gold flowers to match the cup. I decided to put this one up for auction on Ebay today. Don't know why except, I need to start making Christmas money to tell you the truth. Another reason may be that I watch "Hoarders" today. I need to prove that I can get rid of my things, if I want too! The very last cup I want to share is new to my home. It was purchased Friday for $1.49 at the Thirty Store. I just love Limoges. (I know I have said that hundred times.) 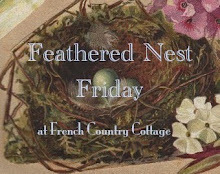 It is by Theodore Haviland Limoges to be exact. 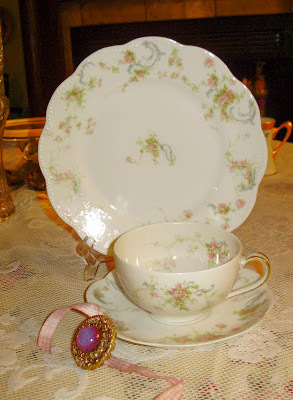 I just love the faded look that Limoges does and the beautiful scalloped cup and saucer. It is just stunning and you can't beat the price. 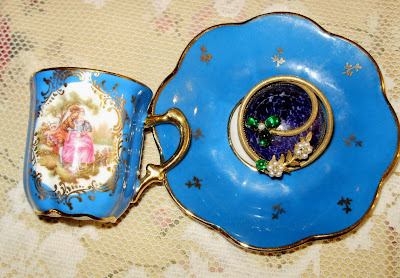 I don't think a girl can have too much Limoges, do you? 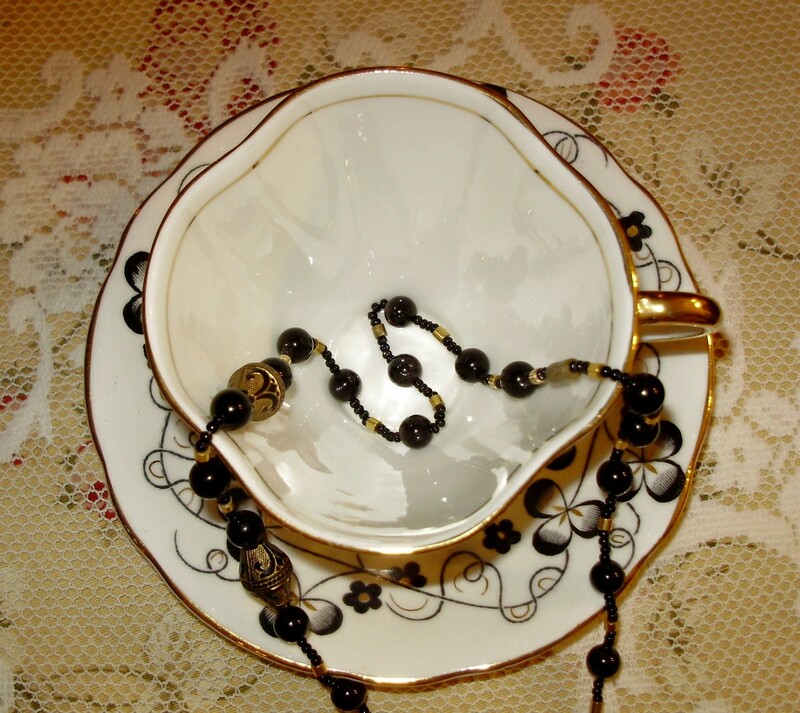 Loving all your teacups but I must say the black and white with gold is stunning! Great find at the thrifty also!! Oh Martha...swooning over that black and white! Oh Course EVERYTHING is wonderful. 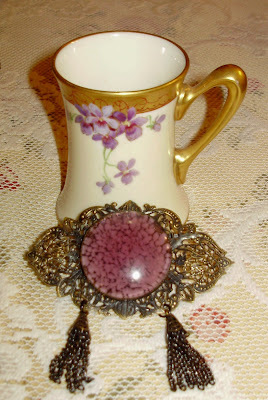 BUT I'm in LOVE,LOVE,LOVE with the Limoges Demi!!! Wow the color is to Die For!!! 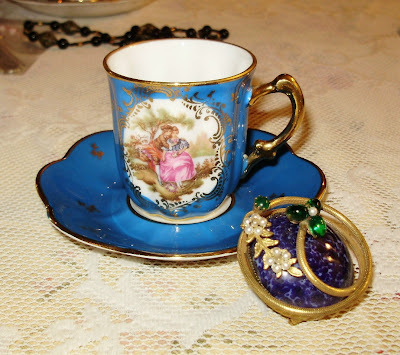 Lovely teacups as always but I love the blue Limoges demi tasse! That's the cutest thing! Hope you're feeling better. 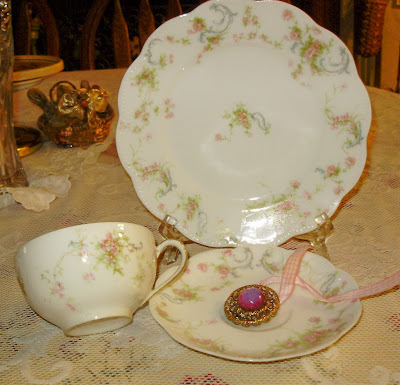 Hello Martha :) Once again you have shown us ladies some striking teacups from your VAST collection :) My favorite is the Limoges set too; I have a few pieces of this similar pattern, and just love it! So very feminine and delicate. Wishing you a lovely Tea Tuesday my friend!! 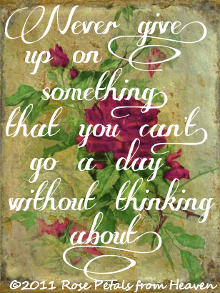 You must have lost track of Tuesday because you were absorbed in the 'Hoarders' marathon on T.V. I was! Nothing motivates me to clean up and clear out the clutter than watching that show. It must not help that a lot of what you have collected is quite nice and not what anyone would call junk. Where do you begin? That being said, I love your choices and have never seen a teacup like your first set. The teacup you're selling on E-Bay is very pretty, the blue is stunning. I think I like best the bargain you picked up though. You're right, can't beat that price or pass up such a treasure. 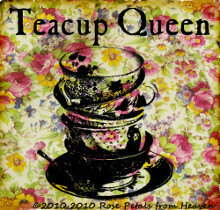 I love the collection of teacups you've showcased this week! The black and white scrolly clovers is stunning and I can only imagine an entire set of this setting a table! You could use any other color as an accent. And NO!! 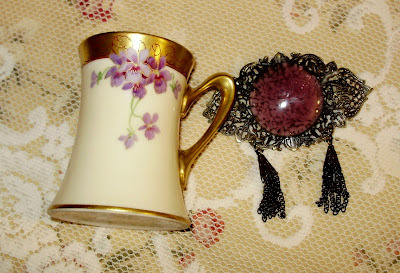 A gal can never have too much Limoges!! Thanks for sharing your treasures!! 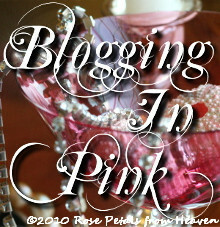 I didn't get a chance to get a post up for the tea parties today, so even if you're late, you're ahead of me!! I LOVE the royal blue of cup #3. But I must admit, cup #1 is my favorite today. And that is odd, because I am so totally not into black. (When I was first married in the mid 1980's, black lacquer was THE thing, so most of my furniture was black lacquer...my bedspread was black and grey...my formal china was black with a gold rim....as a result, I was burned out on black and now pretty much detest it). But for some reason, I love that teacup. It's very elegant looking. Your Limoges is beautiful, and I can hardly believe the price you got it for...that's a steal!!! Finally, my son called me into the room last night to watch the sneak preview of an upcoming Hoarders episode. Let me tell you....you are NOT a hoarder. There is beauty and organization to your collections. The people on that show just have TONS of stuff piled on top of one another to the point that you can't move or sit. That is definitely not you. So, don't worry about liking collections of beautiful things. I am continuing to pray for you. Hope you're seeing God working in your situation. once again you amaze me with your stunnig collection of cups. love love love your Haviland Limoges cup. love the faded color and the dainty floral decor. it's superb! Love them all, dear friend. The black and white and the gold rim with violets are my favourites, just gorgeous. I hope that you are feeling better and sending prayers and blessings to you. Hello Martha, it is good to see you today! Hi Martha, I'm glad to see you and your lovely cups. 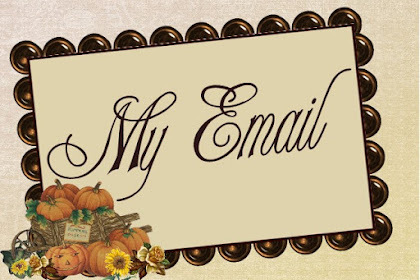 I looked for your post last night, but I know you have been so busy lately and have had a lot of things going on. I hope it has gotten a bit less hectic for you. 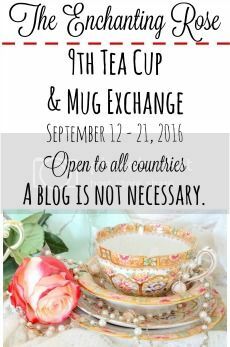 You have a beautiful collection of teacups and I really appreciate your inviting all of us in. You are too funny! Watching "Hoarders" is spooky and I don't think any of us collectors have reached some of the sites I've seen on that show. Having said that, your first set of teacups is absolutely gorgeous! I love the colors and the design, you have quite a collection. Thanks for sharing. 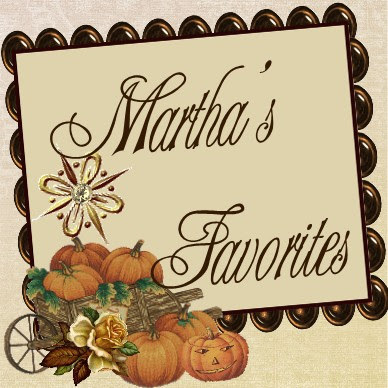 www.marthasfavorites.etsy.com that will link right to your selling site. 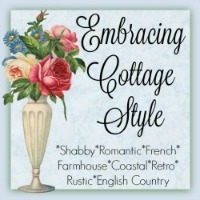 Don't forget to check out our Vintage Alphabet Party every 3rd Monday of the month. 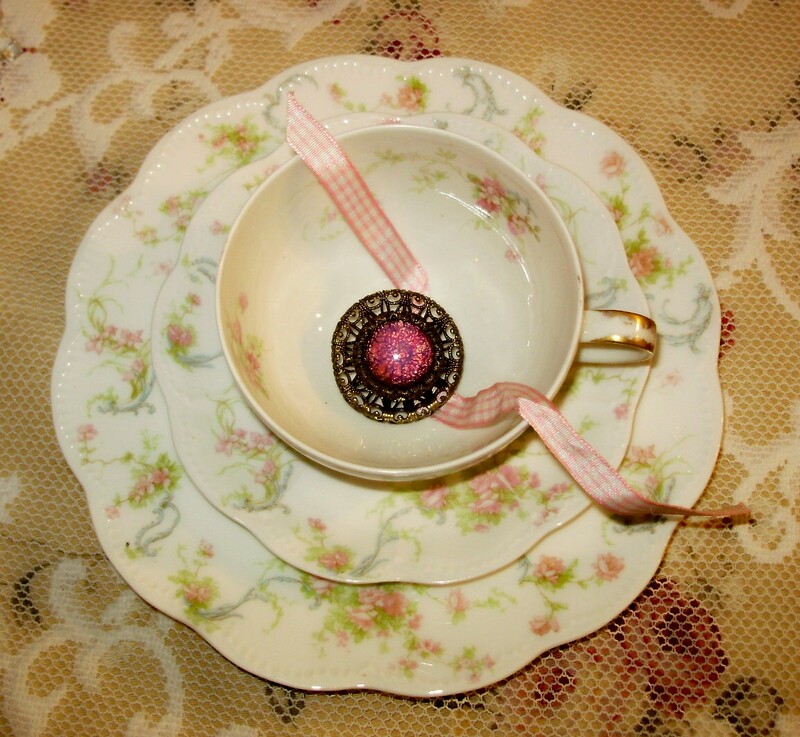 This month are the letters P,Q,& R. Your 'P'orcelain teacups and your vintage 'R'hinestone jewelry,I sooo love, will fit so well. Love the teacups this week, especially that black and cream. Hope to see you the 20th! Your teacups today are all beautiful. 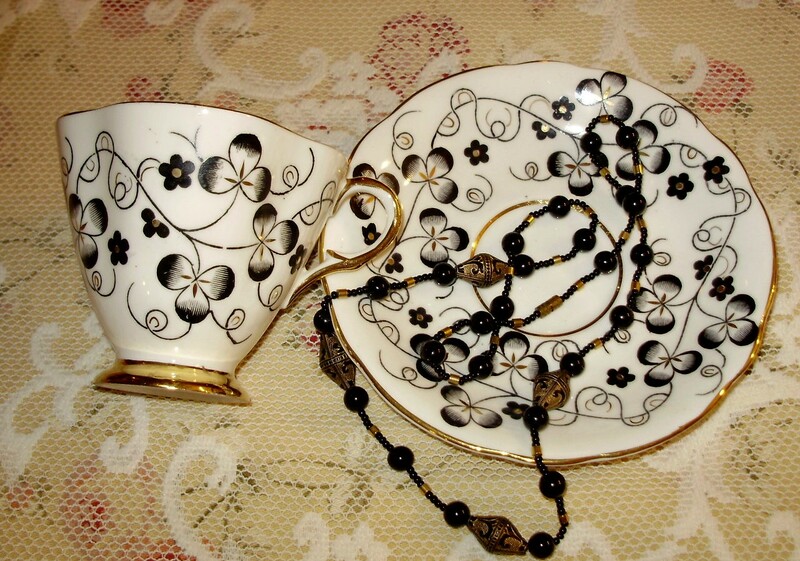 I love the unusual black & white design and I can't believe that wonderful bargain on the Limoges set. 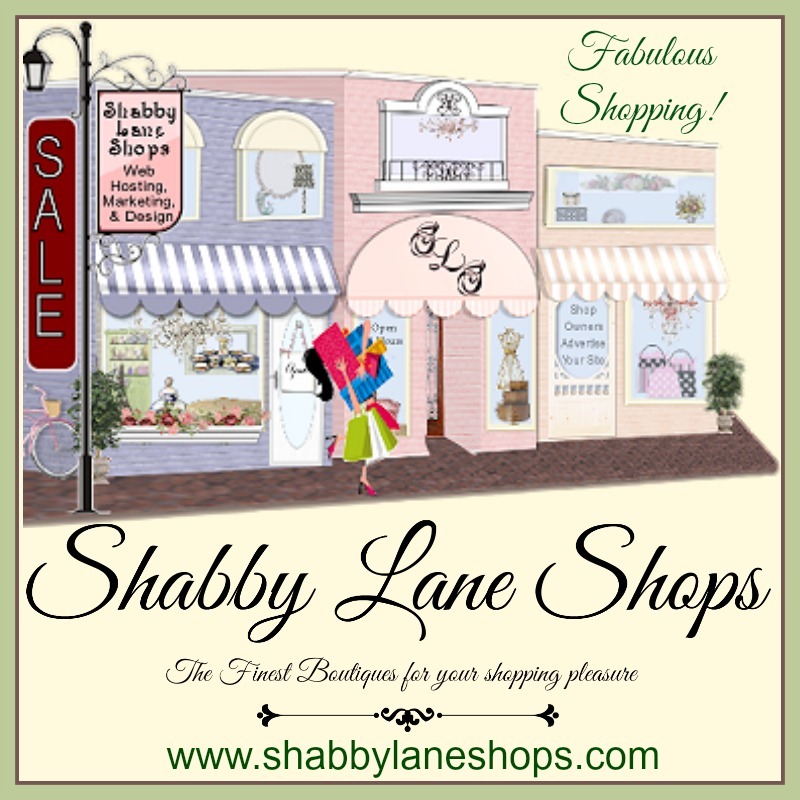 Your jewelry is lovely and I enjoy seeing some of your collection each week. I adore the first tea cup, the black and white one!! So very elegant!! But my favorite of this group of amazing tea cups that you have once again dazzled us with is the Limoges one with the couple on it!! Just to die for! Again, where do you store all of these, my friend?????? Hi sweet Martha. So many pretties again - I don't know where you store them all!!! Lovely! TEA CUP TUESDAY NO. 30! TEA CUP TUESDAY NO. 29! TEA CUP TUESDAY NO. 28! WALK IN LOVE THIS PS!